How many times have you heard about wasted food due to cosmetic damage during shipping, or disposal at the grocery store because it’s older than the best before date? This is the sad reality in the Canadian food industry. It is estimated that we waste $31 billion in food annually. Yet, more and more people are experiencing food insecurity. In Guelph alone, 16.4 percent of households are food insecure. Food continues to be wasted while children and adults struggle to access healthy food. New projects in Guelph are looking to dually address food security and food waste in the city, while also providing meaningful employment and training for youth who face barriers to employment. The SEED is a project of the Guelph Community Health Centre that seeks to address the root causes and downstream effects of food insecurity. Their vision is to create a community with no barriers to healthy food by improving access to healthy food. They plan to achieve this by leading a diverse set of programs in Guelph. The SEED has developed multiple creative programs using the social enterprise model, such as the Guelph Youth Farm, the Garden Fresh Box, Good Food Distribution, and the Community Food Markets. Partnering with the University of Guelph’s Centre for Business and Student Enterprise (now the John F. Wood Centre) Arrell Food Institute and Food From Thought program have created new opportunities to produce shelf-stable products such as tomato sauce and apple cider, which will be made from rescued food ingredients (high quality fresh food that would have been thrown out). These products may be sold at farmers’ markets and local retailers in the near future. The newest program for the SEED is the development of a social enterprise called The Upcycle Kitchen. Many aspects of this enterprise are being informed by work completed with the assistance of the Food From Thought research program. The Upcycle Kitchen will begin with the production of value-added products, produced by youth that are trained and employed within the kitchen. Eventually this work could expand to include a catering service, and/or a front of house café that serves a diversity of products derived from produce that would otherwise be wasted. The SEED hasn’t stopped there. Our team has also been tasked with the creation of a local prospective donors catalogue that could help the SEED identify sources of surplus food for this project. They may make use of existing online networks developed to facilitate the redistribution of rescued surplus food, which could these networks become established in Guelph and reduce food waste. To aid in future Upcycle Kitchen developments, the SEED also has the research assistantship team putting together case study research on the creation of the Upcycle Kitchen, a background literature review on social enterprise and food rescue, and a community toolkit. The tomato sauce business was spearheaded by two undergraduate students participating in the Sandbox program, a joint venture by John F. Wood Centre and the Community Engaged Scholarship Institute (CESI). This project recently won the People’s Choice Award and the Warren & Deborah Jestin Impact Award at the Hub Startup Showcase, on December 5th. 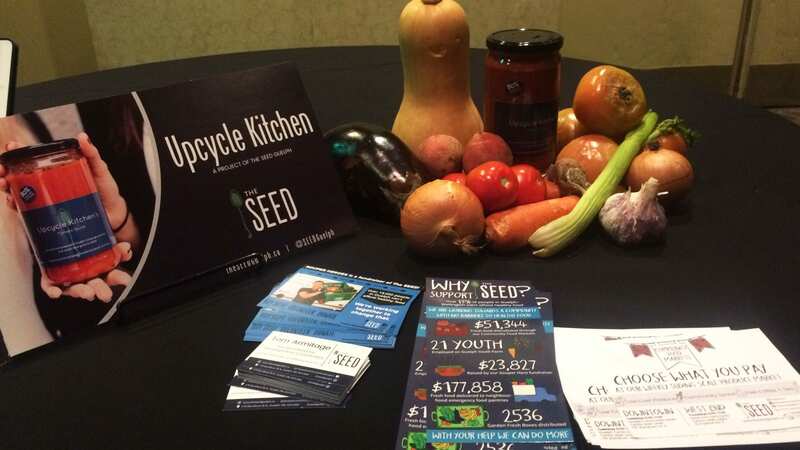 This, and the other upcoming projects from the SEED, prove that creativity can win in the fight to reduce food waste in Guelph. Kamil Chatila-Amosis a master’s student within the Department of Integrative Biology, Chantel Kozachenko is a master’s candidate in the Geography Department, Sabrina Rondeau is a studying for her PhD in the School of Environmental Sciences, and Sara Stricker is currently a PhD student in the Plant Agriculture Department.